Primary Mission: Search for Lost Persons— Southeast Pennsylvania Search and Rescue’s (SEPASAR) primary mission is to locate lost persons and provide such first aid as may be necessary to those located. 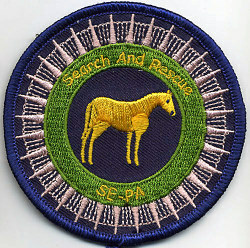 This mission is accomplished by dispatching mounted search personnel to the scene and under the direction of a search operations and or search planning ICS function search areas designated consistent with rider and horse safety. Second Mission: Technical Large Animal Rescue Assistance—On request from extrication or rescue personnel provide expertise in the areas of extricating large animals from industrial, farm, environmental, or road accidents. SEPASAR personnel are familiar with horses and other large animals and can provide expertise in how to lift such animals, how to handle such animals and to avoid unnecessary injury to rescuers or animals. Third Mission: Disaster Relocation of Livestock—On request from the EMA participates in the preplanning for and establishment of federally mandated reception and shelter areas for livestock displaced during a disaster. This would include surveying sites, establishing equipment lists, opening and operating sites, and eventually closing down such shelters. Supervising spontaneous volunteers and cooperating with other agencies would be expected. Fourth Mission: Emergency Transportation—On request from the EMA provide the use of member owned horse trailers and or tow vehicles in an emergency caused by transportation accident stranding animals on the highway or weather conditions such that normal vehicles are not capable of being used. The safety of members shall be considered in answering such requests.